I first heard that quote in the film "The Butterfly Effect". It has Ashton Kutcher in it. Terrible film, but I enjoyed it anyway. Who'd have thought it would be mildly applicable to bet sizing and making money in poker? In this article I’ll highlight how bet sizing early in the hand massively influences how quickly the pot grows. This is important, because big money is made in big pots. Don’t restrict your profit on the river because you accidentally bet too small on the flop. As I explain the following concept I'm assuming we are playing against a single opponent. The size of your bets early on massively influence your total potential profit. This is how the pot grows if you raise 3bb preflop, then bet 100% of the size of the pot on the flop and the turn. Wow, the pot does grow quickly. You knew it grew, but not that dramatically right? Well, it can and it does. Burn the concept of this chart in to your poker memory. Why does it grow so rapidly? Because your opponent matches every dollar you put in to the pot. This means that if you bet the current size of the pot and your opponent matches it by calling, the pot will triple in size for the start of the next betting round. Furthermore, you usually bet somewhere between 50% and 100% of the size of the pot on each betting round. So your bet sizes from one round to the next are "linked" and influenced by how much you've been betting. As you can see, the pot size increases exponentially. This is important, because the size of the pot on the river dictates how much you can bet and get called with. Your opponent would feel better about calling a $100 bet in to a $200 pot than they will about calling a $100 bet in to a $50 pot. They can convince themselves in to calling $100 in to $200, and they can convince themselves out of calling $100 in to a $50. If you’ve got the best hand, you want to see your opponents convince themselves in to making calls. A small adjustment to your early bet sizes will have a dramatic effect on the size of the final pot (and thus the size of your bet on the river). 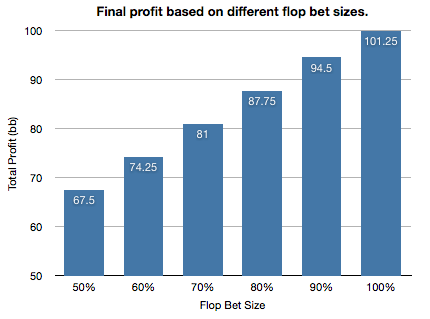 If you get your flop bet slightly wrong, you’ll miss out on a lot more value than you would think. Betting the pot on the flop, turn and river. A breakdown of how much each betting round contributes to the total size of the pot. 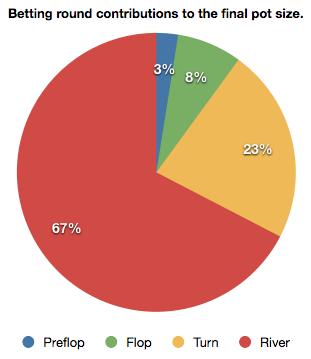 This pie chart illustrates where the bulk of the total pot size is built - (that's if you simply raise 3X preflop, and bet the size of the pot on the flop, turn and river). You can see that you make the 2/3 of your total profit from that single bet on the river. However, don't conclude that the earlier betting rounds are insignificant in comparison to the mighty river bet. That river bet is heavily influenced by the size of your bets in earlier rounds, so you want to make damn sure you're getting them right. Situation: Villain has TPTK. We have the best hand and can't lose. Villain will call anything up to a pot size bet on each betting round. Here's how much we win when we bet different percentages of the pot on the flop, and then 100% of the pot on the turn and river. 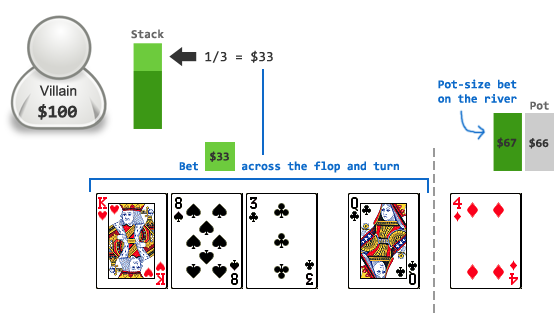 The bars show your total profit at the end of the hand depending on the size of your bet on the flop. By betting 50% of the pot on the flop, we end up winning $67.50 from our opponent in total. By betting 100% of the pot on the flop, we end up winning $101.25 in total (assuming villain had at least $101.25 to start with). Big difference. Big, lucrative, difference. That relatively small $3.75 adjustment on the flop resulted in a cumulative profit difference of $33.75 by the river. So if you knew villain was a habitual caller but you bet half the pot on the flop anyway, you just lost 33.75bb with your mindless bet. Betting 50% on the flop. Betting 100% on the flop. Betting 50% vs. 100% on the flop. Notice how it influences the change in pot size growth from the turn to the river. Small adjustments reap big rewards later on down the line. Remember: The smaller the bet on the river, the more likely it is to get called. I need to take a small step back here to reiterate an important point. You've got a hand you're mostly happy with but not over the moon about. The pot is $10 on the river. What would you feel more comfortable calling - a $6 bet or a $16 bet? $6 obv, and no eyelids would be bat. The less daunting your bet on the river is, the more chance you'll have of getting looked up. The more calls you get when you have the best hand, the more money you'll win. And as we already know, that call on the river adds a lot to our winnings. That’s why I’m making a big deal about this progressive bet sizing thing. So how do I incorporate the concept of progressive bet sizing in to my game? If you're holding a big profitable hand, eye up your opponent's entire stack. Look at how much money they've got in front of them, and make it so that you'll be able to get all (or most) of it with your final river bet. The last thing you want to do is end up on the river without the opportunity to make a sweet bet that covers the remainder of your opponent's stack. Don't get lazy with your bets early on and assume that a big pot will somehow materialise on the river. You have to bet smart from the start. If you're the one leading the betting, it's your responsibility to build the pot. Your flop bet is the foundation, and you can't build a big pot on a weak foundation. So how do we make sure we’re able to make a stack-size bet on the river? Rule: Get 1/3 of their stack in before the river. If you want to set up a pot-size shove on the river for the rest of your opponent's stack, make sure they have at least one third of their initial stack in the middle before the river. Opponent started with $100? Make sure $33 is in the pot before that river card is dealt. Why $33? Because If they've bet $33 of their $100 stack, they have $67 left. The pot must be twice the size of this, as we've had to put in $33 of our own. Therefore the pot size is $66, which is equal to our opponent's remaining $67 (pretty much). It's all about thirds (1/3 = 33%). Opponent puts one third in, Hero puts one third in, both players are left with two thirds in their stack and there are two thirds in the pot. Getting 1/3 of their stack in. If you want to win your opponent's stack, look at their stack. Look at the size of it and work out how you're going to get it. The way you're going to get it (with the smoothest of bet sizes on the river) is by getting one third of it in the middle before the river. As soon as they've committed one third of their stack, they're liable to be facing a pot-size bet for the rest of their chips. Work out what 1/3 of your opponents starting stack is. Bet that amount across the flop and turn. Get a figure to work with, then spread it across the flop and turn. Opponent starts with $150 in a $100NL game. Need to bet a cumulative $50 across the flop and turn. It doesn't oesn't matter. Just get $50 of his stack in the middle by the end of the betting round on the turn and you're all set for a pot-size bet on the river. Tip: Raise to 4bb instead of 3bb preflop if you want to play for 100bb stacks. If you've both got full stacks (100bb) and you've got a hand that you think you could stack your opponent with, raise to 4bb instead of 3bb preflop. That small 1bb increase has a significant knock-on effect to your ability to get stacks in on the river. If you've got the kind of hand that you play due to it's potential for stacking your opponent (e.g. a suited connector or a small pocket pair), then consider raising to 4bb (or more) instead of 3bb preflop. You play these hands to try and win stacks, so create a situation where that can happen. By raising 3x, you have to bet $75.40 in to a $50.70 pot on the river - kinda awkward. By raising 4x, you have to bet $68.64 in to a $64.22 pot on the river - not so bad. With 100bb stacks, If you raise 3bb preflop you're going to need to bet 100% of the size of the pot on the flop and turn for a pot-size river shove. Find your own notable results by playing with my spreadsheet (below). I made this basic spreadsheet to help myself get to grips with how the stack, pot and bet sizes change going from: preflop > flop > turn > river. 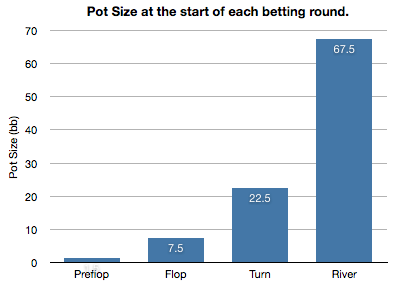 It helps me to see how the size of the pot increases in relation to the size of the bets, from one round to the next. This spreadsheet assumes I'm going to shove the river 100% of the time to try and win the maximum amount of money possible. I play with the bet sizes prior to this river bet to see how comfortable or awkward my shove will look. Don't expect to "learn" anything directly from this spreadsheet – just play around and familiarise yourself with how betting different percentages of the pot on the flop and the turn affects the situation on the river. It's all about familairising yourself with how stack, pot and bet sizes are connected. The pot grows quicker than you think. Your bet sizes early on in the hand are more important than you think. If you’ve got a great hand that you want to gain maximum value from, bet smart - starting with the flop. Look at the effective stacks and plan accordingly. You’ll get better at effective bet sizing the more you do it. It will become second nature and you’ll wonder why you ever needed to read this article in the first place.